Bellevue, WA – Puget Sound Energy (PSE) wants to build an extra high voltage (230,000 volt) power line through four cities on Seattle’s Eastside. For most of its route, the proposed project would be located within feet of the twin Olympic jet fuel pipelines that carry thirteen million gallons of high pressure jet fuel and gasoline per day through the heart of the Eastside. 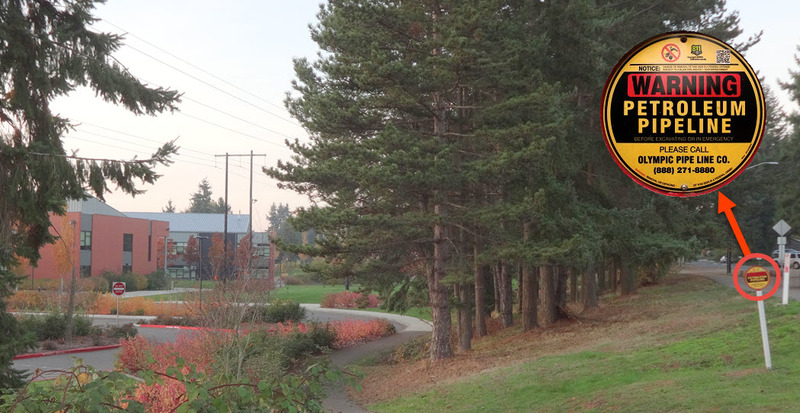 Tyee Middle school, a Bellevue school district public school with nearly 1000 students, is situated less than 70 feet from the wires and only 170 feet from from the pipeline. Tyee Middle school is only 70 feet from power lines and 170 from a high pressure jet fuel pipeline. California requires a 1500 foot separation between schools and pipelines. In response to comments submitted by both the public and CENSE during the project’s comment period, PSE hired a consultant to study the risks posed to the pipelines by the significant increase in voltage. The consultant, a well-respected international firm, found severe safety deficiencies in several areas of PSE’s proposed project. Most concerning is that the study never examined the safety risks of performing major construction near the pipeline. This is the same pipeline that exploded in 1999 in Bellingham as a result of a minor construction accident involving a city approved contractor, resulting in the deaths of three children. PSE’s project is currently entering the permitting phase. CENSE, along with three other local environmental groups and tribes, believes that there are smarter ways to enhance the year-round reliability of the electric grid. However, Washington state regulations currently offer generous financial incentives that lead utilities to prefer transmission lines over smart technology that is both safer and better for the environment. However, there are several ways that citizens can seek a better outcome. CENSE is hosting an event that is open to the community on Thursday, November 2nd at 7 p.m. at the East Shore Unitarian Church (12700 SE 32nd St, Bellevue, WA 98005). Don Marsh will share important updates on how CENSE is organizing efforts for smarter, safer solutions. CENSE attorney Rick Aramburu will speak on how the project’s process works. More info here: Big News Event!